Every encounter was a wonderful discovery, but the Australian and New Zealander chefs blew me away! They have a very distinct personality and a very unique cuisine that mixes technique, technology and influences from Spain, Japan or Thailand. They are all linked in the research of the best product (produce) and the freshness of the instantaneity. I interviewed Daniel Puskas several months ago while working with the chef Martin Benn at Sepia, it was the first time I did an interview with a “sous chef” for this series, but what a ”sous chef ”, remarkable! 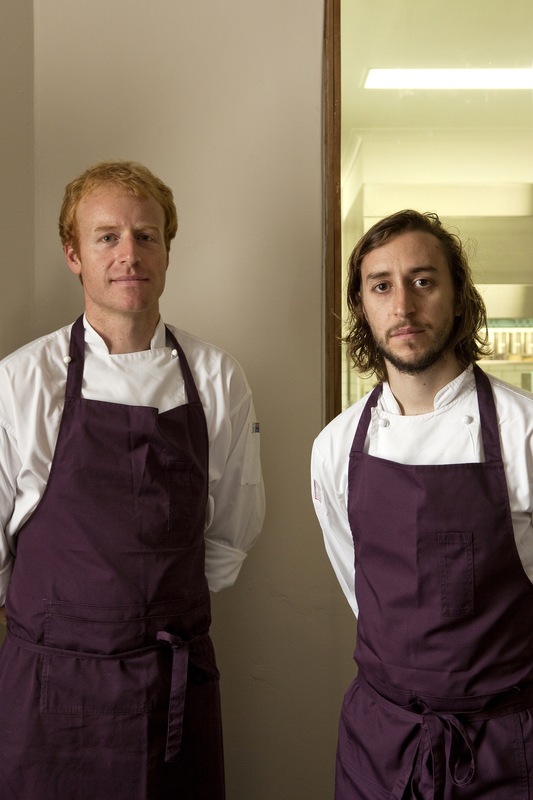 And in fact, less than two years later it has just opened his own restaurant, Sixpenny with Chef James Parry. I can say that with their roadmap and passages in the kitchen of several great chefs, it was written in the sky were our two acolytes would open their own restaurant. Puskas, it is Tetsuya’s, Zuma, Sepia and Parry it is Kwong, Barber, Aduriz, but it is at Oscillate Wildly that the two chefs worked together and promised to open a restaurant. Just open, Sixpenny received several compliments and accolades. Sixpenny that’s more than two excellent creators, Puskas and Parry have a broader view (a reflection) on the world of gastronomy (“cuisine”) and this is reflected in their “cuisine à 4 mains”. But I recognize in the menu or the recipe attached the touch of Daniel Puskas. A perfect mastering of techniques, science and an extensive knowledge of the products. The cuisine of Sixpenny is at the service of “Nature” (local), it is a cuisine that highlight of the essence of a product. 1-(Scoffier) One year ago, you tell me : “My goal is to one day have my own restaurant cooking contemporary Australian food with a focus on using local suppliers. To do this, I plan to create seasonal menus and use produce from my own garden or sourced from our local suppliers who we have developed good relationships with .”And now, this is the concept behind Sixpenny? How do you explain the philosophy behind your cuisine? DPuskas/JParry- We like to cook food that is tasty and that we are proud of. We like to enhance the flavors of the individual ingredient. We try to grow as much as possible, the more we grow the more we understand the challenges of growing this gives us a much greater respect for the ingredient. DPuskas– My Nana’s greens beans. She grew these in the backyard and I remember picking them with her. As a child I refused to eat any other green beans. JParry- Family meals, my motivation to cook comes from these gatherings with my family. Knowing the joy that it brings to everyone. 3-(Scoffier) Do you have a mentor (chefs or anybody else) that inspires your cuisine? DPuskas– I am inspired by a variety of chefs, both local and overseas, for different reasons. Andoni, Bras and René Redzepi inspires me with their love of nature and natural approach to cooking, sourcing native and seasonal produce. On the other hand, Ferran and Albert Adria inspires me with their innovative modernist approach to cooking. They use new techniques and products to help achieve textures and tastes in food that otherwise wouldn’t be possible. Heston (Blumenthal) playful yet refined cuisine is interesting in that it creates modern dishes based on historical foods and events. Locally, Martin Benn, Mark Best, Dan Hunter and Ben Shewry are, in my eyes, defining and shaping Australian cuisine with their distinctly unique food. I also take a lot of inspiration from my close friends/chefs. We are always chatting about what we are up to in the kitchen and offering helpful advice. Without them I wouldn’t be the chef I am today. JParry– Inspiration comes from everywhere Chefs I’ve worked for (Andoni Aduriz, Dan Barber, Kylie Kwong) and chef friends I’ve worked alongside (Rosio Sanchez, David Toutain, Leandro Carrera) my family, and our producers people like Beth and Hayden McMillan, Richard Gunner. Reading is also very important not just cook books but about farming, food history, human history. Joel Salatin is a great leader in regenerative agriculture, his books and work are truly amazing. 4-(Scoffier) You have worked at an unique restaurant (Sepia) with an excellent chef, Martin Benn, and the restaurant has earned many accolades. What differentiates your cuisine at Sixpenny of that of Sepia? DPuskas– Martin’s food is very modern and fun with a lot of japanese influences, at sixpenny we concentrate more on the individual ingredient. We always start by looking at whatever it is we are using for example a ‘sweet potato’ and say how can we enhance the flavor of that ingredient to make it the best tasting sweet potato you have ever eaten. 5-(Scoffier) You made a stint at Mugaritz, what did you learn of the chef Andoni Aduriz? JParry– Andoni is an amazing Chef who leads an equally amazing team. He constantly reminded us that Mugaritz is more than a restaurant it’s a way of life. The passion that drives you be a great chef should also drive you in all aspects of your life. I constantly reflect on my time in Spain, it’s was an amazing experience that will forever influence and inspire my life. 6-(Scoffier) You worked together at Oscillate Wildly, how your “cuisine” has it evolved since then? DPuskas/JParry- Perhaps technique was at the forefront in our cooking whilst at Oscillate, now we encourage the produce to lead the way. We still use and have great interest in technique, it’s solely no longer the focus. 7-(Scoffier) How do you develop your recipes for your Tasting menu? What are your source(s) of inspiration ? DPuskas/JParry- We look at the bare ingredient and work out how to build the dish from there, giving all ingredients equal respect (allowing a sweet potato or a baby gem lettuce to be the focus of a dish). We think about what it is that makes that ingredient unique and try and emphasize this. If the ingredient is good enough, what could we possibly do to make it better??? 8-(Scoffier) I could be wrong but I found that there was an interesting search for wine in your Tasting menu? How did you select the wines? DPuskas/JParry- As we said before with our food it all comes from local suppliers we try and carry that same idea on with our wine. 80% is from NSW and the rest is made up from around Australia. 9-(Scoffier) Can you give us a detailed recipe (Signature dish or other) that is characterized the cuisine of Sixpenny? 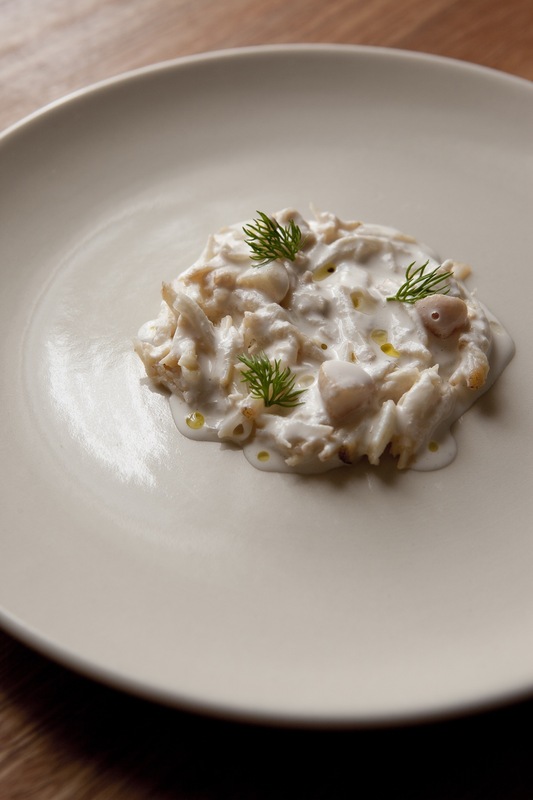 Recipe: Steamed Mud Crab, Silky Macadamia, Chamomile. DPuskas/JParry- We can only hope that sixpenny grows and evolves with us, we hope that we can keep creating unique experiences and inspiring others to care a little more about the food they eat and perhaps try growing a thing or two themselves. 1. Put crabs to sleep before beginning the cooking process. Vac the crabs in large vac bags but first wrap in glad bake to prevent the claws punching holes in the bags. To cook steam in the combi oven set on 90°C steam until the shell turns red. On a 1200g crab this will take approximately 50 mins. Once cooked pull out of the oven and let sit at room temp for 10 mins, then in cold water for 10 mins, then in ice water for 10 mins. Once cold pick crabs and portion into 25g portions. 1. Preheat oven to 160°. Determine amount of milk you want to make in weight and weigh out approximately the same amount of macadamias as the ratio is 1:1. Roast ¼ of total macadamias in the oven just until golden. Be careful not to take too far. Approx 6 mins. 2. Add the ¼ to the other ¾ and blend with the equivalent amount of water in the thermomix until completely combined. Do this in small batches if you are making a large quantity. Put into a container and allow to sit overnight. 3. The next day squeeze out the milk by placing small amounts in a superbag (or oil filter) squeezing out as much liquid as possible. 4. Vacuum seal portions in small vac bags to maximize shelf life. 1. Roast in oven at 160°C for approx 8 mins or until golden brown. Chop into halves. 2. Garnish with fresh Chamomile leaves and flowers. 3. Also garnish with dots of olive oil.